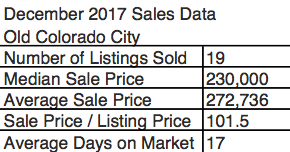 Click here to view historic sales data for Old Colorado City. Scroll down to view the latest listings in Old Colorado City. Historical locales, lively entertainment, and a close-knit community make Old Colorado City an exciting neighborhood to live in! Located at the heart of El Paso County, this area offers fast and easy access to downtown Colorado Springs and Manitou Springs. Highway 24 runs parallel to Colorado Avenue, leading west to Woodland Park and all of the adventures that the Rocky Mountains have to offer. Interstate 25 is just a few minutes east of any location in Old Colorado City, providing fast access to the entirety of Colorado Springs. Old Colorado City has hosted emporiums, community events, and great restaurants for over 100 years. Gift shops and boutiques surround Colorado Avenue and Bancroft Park, a place to relax outdoors at the center of all of the action. French, Thai, Italian, and Greek cuisine is available throughout. And who could forget coffee and dessert? With over one dozen dining options, there’s sure to be something for everyone’s taste. After dinner, be sure to visit one of the world-famous art galleries located within walking distance of your meal. The always-controversial wall art splayed across the outside of West Side Tattoo and the Magic Town interactive tour at Michael Garman Galleries offer something to talk about year-round. Nearby attractions include the Cave of the Winds, the Manitou Cliff Dwellings, and Garden of the Gods, where the state’s natural beauty can be experienced through rock climbing, mountain biking, or just a casual stroll. While all of Colorado Springs can be taken in at once from the top of the Manitou Incline, the summit of Pikes Peak holds the best view of Front Range and can be reached through a drive up the Pikes Peak Highway, a hike up Barr Trail, or a ride on the Pikes Peak Cog Railway. Seasonal traditions and weekend events abound in Old Colorado City. Christmas time brings a redecoration of Magic Town, a chance to visit Santa in his workshop, and the Victorian Christmas Stroll celebration. Bancroft Park hosts concerts and markets throughout the summer, including a farmer’s market every Saturday from June to October. However, the most famous event of the whole year, Territory Days, closes down most of Colorado Avenue for the whole Memorial Day weekend to make room for dozens of vendors featuring the tastes, sights, and sounds of the Old West. A variety of pubs and bars give Old Colorado City a vibrant night life, as well. No matter what time of year, there’s always something exciting happening on Colorado Avenue. Established in 1859 during the Pikes Peak Gold Rush to supply nearby mines, Old Colorado City served as the capitol of Colorado Territory until Denver took over that role in the early 1860s. The Old Colorado City Foundation works to preserve the heritage and history of the area, keeping Colorado Avenue in clean, safe, and historically accurate condition. Visitors to the area can even take a walking tour of Old Colorado City using an app available for both iPhone and Android. 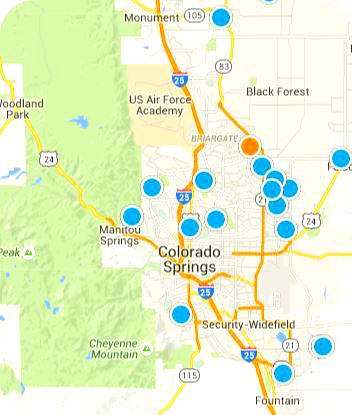 Residents can thrive in the area, as well, having easy access to several Colorado Springs School District 11 schools, including West Elementary and Middle Schools and Palmer High School located just a few blocks away. Most amenities are very close to the homes here, and things that aren't within walking distance are just a short car ride or bus trip away. This area provides an exciting look into Colorado history, and the local community makes it a great place to live, as well.